One day before the MLB rosters expand to a 40-man roster, the Giants made some significant moves. Pat Burrell was re-instated from the DL and the Giants officially purchased the contract of Brett Pill from AAA. The first move wasn’t too much of a surprise because Pat’s foot is healed, and management hopes he can provide that spark that he provided last year during the playoff run. The second move, however, is a little more surprising seeing that Brett Pill hadn’t been discussed all year. To many Giants fans, this is good news because Pill was hitting .312 with 25 home runs and 107 RBI’s this season. Additionally, he can play first base, second base, 3rd base, and left field, so he’s a strong utility player. He also has been the Fresno Grizzlies’ MVP for the past 2 seasons. All in all, 2 great roster additions. It gets better though. The Giants designated for assignment Aaron Rowand and Miguel Tejada. YAY!!!!!! Finally! If you’ve watched your share of Giants games this year, I don’t have to tell you that this is GREAT news. Neither were producing the way the Giants hoped they would. They were both aging players who were way past their prime and didn’t really provide any extra help in any way. Rowand had some occassional pinch hit home runs and would sometimes make some nice plays in the outfield, however Pat Burrell is a better option and a better fit in the clubhouse. On the contrary, there were several rumors that Tejada was not happy in the clubhouse and wasn’t feeling appreciated. Appreciated for what? Doing nothing? Anyway, when asked to lay down a sacrifice bunt in a recent game, he pouted and scowled after bunting and basically gave Ron Wotus (acting manager for the game since Bochy was ejected) the death stare. Not exactly the type of personality that you want in a clubhouse that is already stressed out and doesn’t need unnecessary, childish drama. Tejada takes the Biedrins award. He is the definition of uselessness, and I’m very relieved that he is gone. Great day for the Giants in order to upgrade the roster. Hopefully they can get a win against the Cubs today. Duane Kuiper is a genius. Not only does he know baseball, but he is excellent at coming up with slogans or, in this case, nicknames that are extremely fitting. Kuip was the brains behind dubbing the 2010 season for the Giants as “Torture.” Now, he has started a brand new trend. Brandon Belt is the “Baby Giraffe.” What you have to understand, as Kuip explains, is that it’s not that Brandon Belt looks like a baby giraffe; he just runs like one. While broadcasting a game a while ago, Kuip was teasing Belt for looking very awkward while chasing after a fly ball. Since Belt’s true position is first base, he does look a little uncomfortable in the outfield. Since this nickname has surfaced, many fans are bringing out all the giraffe paraphernalia they can find. Many fans have begun to wear hats very similar to the panda hats that you can find every 2 feet at AT&T Park. I’m sure that for the rest of this season and next season when Belt will get more consistent playing time, the giraffe hats will be almost as abundant as the panda hats. One fan recently sent Belt a lovely plant. How nice, right? Wait until you see what the plant looks like. Very, very cute. It must be a little embarrassing in the clubhouse for him, but still very cute. Other fans have brought stuffed animals, drawings, posters, and many other displays of their love for our very own baby giraffe, Brandon Belt. Most of this lovefest has occurred in AT&T Park though. The real indication that this trend has become bigger and better is that it’s spread to Six Flags Discovery Kingdom. A baby giraffe was recently born at Discovery Kingdom, and was named….BRANDON! Bet you didn’t see that coming…Check him out here! By the way, big props to Duane Kuiper on making Six Flags a Giants fan. Clearly, the “Baby Giraffe” movement is going places. The movement that is coming along a little more slowly, but is surely gaining ground is the “Awkward” movement. Brandon Belt’s friend called him “The Most Awkward Man in the World” (based on the Dos Equis “The Most Interesting Man in the World” campaign), and Brandon thought it described him perfectly. Anything he does is awkward. Think of something that wouldn’t seem awkward to the average person. Well, Brandon Belt makes it awkward. That’s just what he does. This nickname ties into the baby giraffe nickname, because they both describe his awkward personality and lanky frame. In a recent road series against the Astros, Brandon’s family and friends came to watch since his hometown is only an hour and a half away from Houston. Brandon’s parents donned orange “Keep Belt Awkward” shirts. Every website that carried those shirts has sold out because of such high demand. I’m sure we’ll be seeing those shirts around AT&T Park in no time. Read about Brandon Belt’s view on all the hype surrounding him in the Giants’ Veteran And Rook Blog. No matter how awkward Belt is or how much he looks like a baby giraffe when he moves around the outfield, he is the young phenom that could become the Giants’ next Buster Posey. He’s smart, athletic, strong, and can make adjustments at the plate when needed. 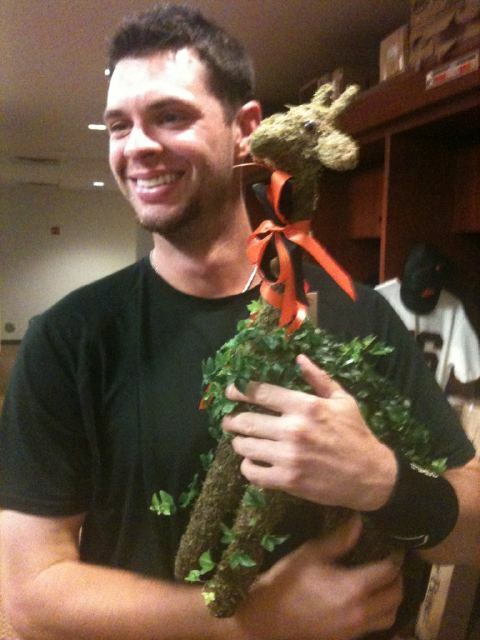 If the Giants’ future rests with a baby giraffe, I’m fine with that. This is the first real writing piece that I’ve had published, and it was so fun to write. I am bound to have an opinion about anything, so to be able to share mine about something that I truly love, the Warriors, was incredible. I hope to write more pieces like this very soon. I guess this is where this blog comes in. With Andris Biedrins proving to be quite useless and ineffective, it’s time for a change for the Warriors. Besides front office moves, the new ownership of Joe Lacob and Peter Guber have failed to make the promised “bold” acquisitions that the fans were expecting. However, as honorary GM of the day (I can dream, right? ), I will make the “bold” move to start Jeremy Tyler this upcoming season at center. The Warriors acquired Jeremy Tyler, the 39th pick, on draft night by purchasing him from the Charlotte Bobcats. The 20-year-old, 6-11, 262-pounder originally from San Diego is a potential high-risk, high-reward player who decided to forego his senior year of high school to play overseas in Israel. After a year of hardship, Tyler decided to take his talents to Japan. Despite rumors of maturity issues, Jeremy Tyler understands the significance of being drafted and seems to have great character and spirit. When given his Warriors jersey with the #3 on it he said, “This is what I’ve been working for my whole life. I’ve got it, and now, I can’t lose it.” Tyler seems like he has truly become a mature adult, even though he is only 20 years old. His hard work, determination, and perseverance are his “X factors” that will ultimately give him the edge in the starting center battle. 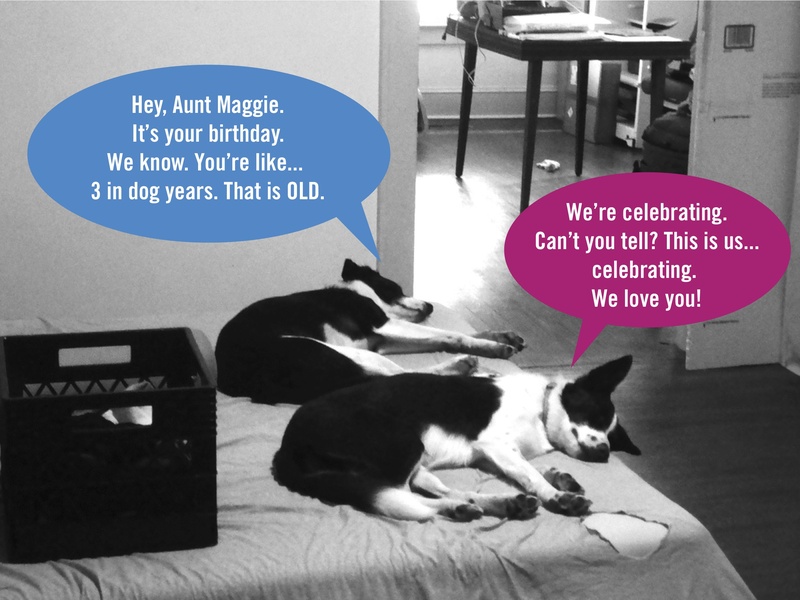 One of the best birthday cards I’ve ever gotten. From Junebug and Aidan. For my first post, I just want to thank my sister, Emily, for helping me set up this blog. Although she can be quite insane at times, she is my role model, so thanks Em for everthing! Also, I’m turning 20 tomorrow! I can’t believe that I’m finally going to be rid of my “teen” status and that now I’ll have to be more mature and adult-like. I guess having my own blog is my first step into real adulthood. That’s it for now. Go Giants!